This recipe makes a lovely filling fall salad. It’s quick and easy to make. Wash and cook the lentils in salted water, until they are cooked al dente. Remove from the heat, rinse with cool water and place in a bowl. Clean and de-seed the red bell pepper, cut it into small pieces and if wished, saute until softened, or use raw. Add the red pepper pieces to the lentils. Make a sauce from the olive oil, lemon juice or vinegar salt and pepper and pour over the lentils to season. Make a light sauce from the soy yogurt, a splash of lemon juice, and if desired a pinch of sugar. Clean the figs, slice in half and lightly grill for 23-4 minutes. 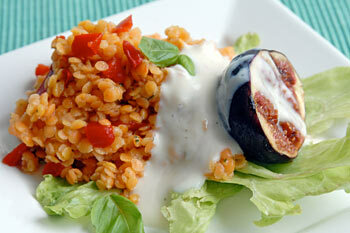 Serve a small amount of lettuce of choice on a plate, 2 or 3 tablespoons of the lentil salad, one half of a fig next to the lentil or laying on top and a dollop of the seasoned yogurt on top. Drizzle a few drops of ginger syrup on top of the yogurt and fig. You can alternatively use eggplant pieces in stead of the red bell pepper. If so, lightly saute the eggplant pieces so that they are light brown. Posted by Chris Walker on October 17, 2007 in Bell Pepper, Figs, Lentils, Salads.